With the addition of seating furniture can be made interesting for two points of view; the users and their friends. Of the set of nodes used to add seats or avatar spots, seat is responsible for the user, Catcher and Pitcher the interactions with other avatars. They are essentially positional markers indicating where the user, Catcher, and their partner, Pitcher, are placed during an interaction, both generally facing one another. For more information on furniture skeletons click here, adding seats click here and seat Handles click here. If Catcher and Pitcher are omitted IMVU will auto-insert them to the best of its ability. 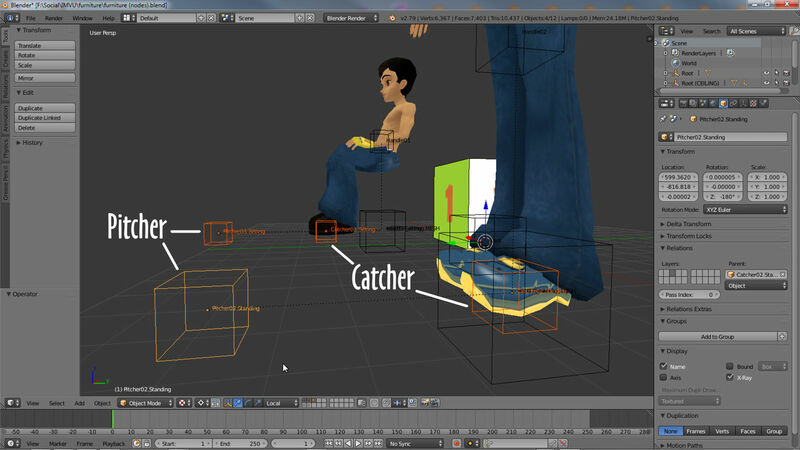 The Catcher and Pitcher nodes are positioned relative to each avatars feet, not the seat node as might be expected. To work properly the Catcher and Pitcher nodes are governed by two simple rules; 1) they are the same distance from one another regardless of the pose, and 2) they face away each other. The first point should generally never be changed as it ensures co-op or interactive actions appear without gaps or positional issues between avatars. And the second that they face each other. Using Local orientation in Blender this means the ‘Y’ axis (green handle of the 3D Widget) for Catcher points backwards matching seat and Handle, with Pitcher pointing forwards. Download the furniture starter file here. Changes to distance and orientations doesn’t break functionality, it just means that avatars don’t appear as expected. The distances and orientation of Catcher and Pitcher ensures the avatars always face each other – approximately arms length (the ‘friends zone’!). As a pair of nodes, although the default position of Catcher and Pitcher is relative to the feet of each avatar, they can be moved or offset anywhere so long as the two main rules above are obeyed, this is often useful in preventing avatars appearing inside furniture. In Blender both nodes should be selected, moved or rotate into position as a pair not individually as this ensure the distance between, and their alignment to one another, doesn’t change. When the Catcher and Pitcher nodes are being manipulated ensure Global orientation is active else the nodes will move independently from one another. By default Catcher and Pitcher are aligned perpendicular to the avatar but can be re positioned. 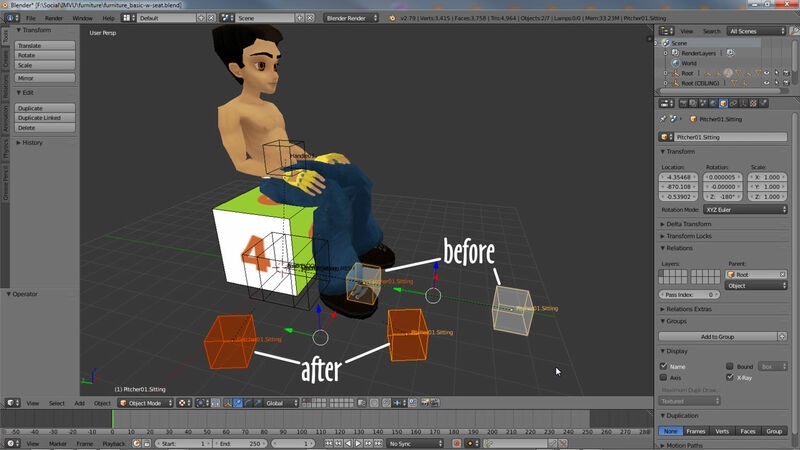 Simply select both nodes as a group in Blender and manipulate (translate and rotate only) as a pairing. As with other nodes within a seat group, Catcher and Pitcher are parented to Root. 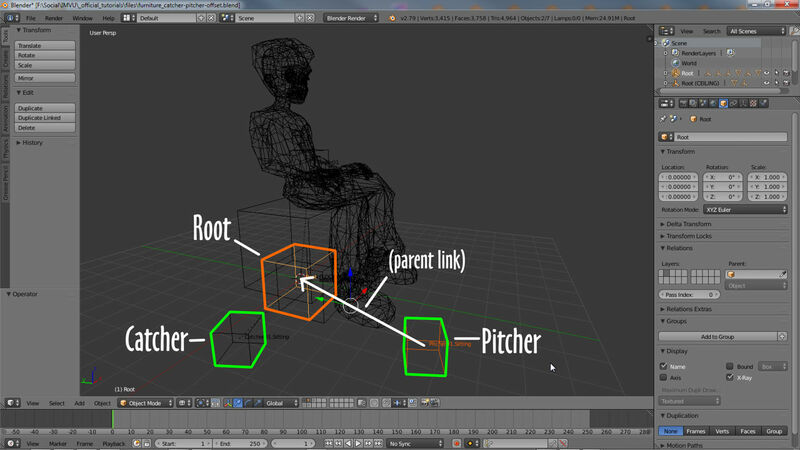 In Blender select either/or/both Catcher and Pitcher first, Root last to ensure properly hierarchical relationships, then make sure to select Object » Parent » Object, Object (Keep Transform), especially if the nodes have been moved. When animating items with avatar spots, where seat and Handle are parented to the animation control node (in-turn parented to Root), Catcher and Pitcher can be parented to Root because they don’t specifically need to move. Catcher and Pitcher, like other seat nodes, must be parented to the furniture items Root node – select each in-turn, Root last, and Parent.